Over the last 10 years the club has been in existence we have never raised the price on any of our discs. As you can imagine, disc manufacturers have risen along with inflation. Because we value paying out as many players as financially possible on Monday & Thursday evening, we will be discussing & voting on a possible price increase for doubles registration. Stew has done an amazing job of building the club some new benches to replace several rotting ones. We’ll need some help setting these new benches into place. We’ll be voting on a day so that we can make this happen. October is right around the corner and we are starting preparations for the DEPC. All members present will be voting on the invested amount of merchandise for CFR discs. These are the custom order discs that will feature the DEPC 2014 logo! The GVDG club officers & board members have been invited by the city of Greenville to the Bradford Creek Golf Course next week to discuss the possibility of expanding this ball-golf course to include a Disc Golf Course. Bradford Creek is looking for various options to increase traffic and revenue for their grounds. It's that time of year again to nominate the GVDG officers for 2014 - 2015. If you want to run or nominate someone to run get your nominations in at either Monday or Thursday doubles next week. Voting will take place from the membership monthly at Robert Avery's on May 3rd throught Thursday doubles the following week. You can vote in person at any of the 3 events or at anytime during the week via email sent to gvdgsecretary@gmail.com Emil's need to include your name as we may not recognize your email address. Remember only current club members may vote so pay your dues soon to be eligible to vote. I know a lot of people have been looking for some new plastic in the club store lately. Unfortunately it was not prudent to order additional discs due to the large amount that was previously left in the store. All of last year we only made one disc order, and that was used primarily to replenish base line DX plastic that was low. Thankfully with the start of a new doubles season we are finally in a comfortable place to order new plastic and we are looking for as much input as possible. Please post here or contact a club officer about any plastic from Prodigy, Discraft, and Innova that you would like to see ordered. We will be looking into additional vendors after this order. April 2014 Club meeting @ AJ McMurphy's. 1-Finances- Account balance $676.97, no activity recently. 2-Monthlies- Membership Appreciation-Max is getting in contact with Robert Avery, may use Bob's house if fall back is needed. St. Jude-Agreed that Jersey Mike's is best lunch option, Jim designated jobs to those in attendance. 3-Sponsorship-Kings Cup $100 sponsorship, seconded and approved by all. 4-Club Elections- Will be posting information on Website and Facebook about positions and duties and time frame. 5-Work days-April 18th before St Jude to work on tourney prep, Jim West leading. April 27 at 1PM(after Baggers) working on trash pickup behind 17, Max and Jim leading. 6-DEPC-Flier coming in May, working on designs for an official permanent logo to go with annual theme logo. 7-Membership drive- Max and Jim will coordinate to get signs posted about membership benefits and details. 8-Tshirt design - Original club shirt with 10th anniversary under front logo. Seconded and voted by from all present. 10-Soccer league- GVDG was contacted by Recs and Parks about a possible summer soccer league playing on Sundays from 10A-3P. Parks has stated they will not permit league due to conflict with disc golf leagues already established. 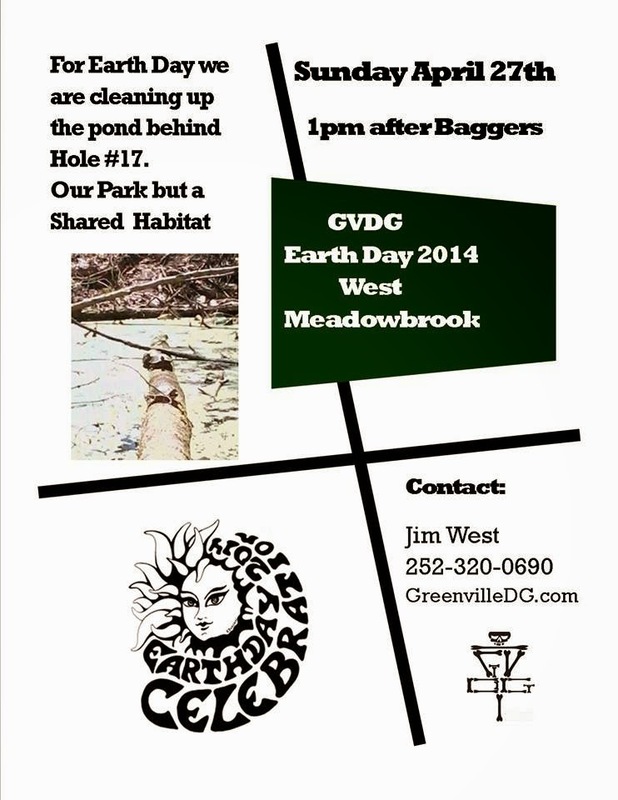 GVDG workday on Sunday April 27th as part of Earth Day awareness. We will be cleaning out trash from the pong behind hole 17. Please bring any long grippers/poles/nets you may have, some tools will be provided. Meet at 1PM. Finances - The club currently has right around $500 in the bank. Max will be taking a check to Wilmington for Azalea Pro and Am sponsorship that was voted last month. Club meeting locations - April: AJ McMurphy's, May - Possibly Stew's waiting for confirmation. After monthlies we are going to start doing a quick club meeting review and open floor for those unable to attend the club meetings, first one will be after the St Jude monthly in April. Chris Gill has offered to reach out to Lowe's and see if we can get some deals on materials for upcoming course projects. Ground Crew open-Sean has recommended we have the event in November after the DEPC to encourage work on the course throughout summer and depc prep. -Sean has identified a strong growing vine we intend to plant on the mando on hole 10 to spruce it up a bit, Max will be getting bricks from his office to make a base to ward off the mower. -Replacing the boards on the bridge to 9, adding additional brick to the walkway. -Tree planting project to define the barrier between holes 12 and 13, and between 14 and 15 Blue pad. -Permanent OB line defining holes 3-6. -Replace damaged sign posts and benches. If you see a project you can assist with, or have suggestions on additional projects please contact Max, DC, or Goo. Website maintenance, please contact DC with any suggested website updates. He is planning to get the site spruced back up. Adam Baker has published a proposed modification to the club bylaws, please review them for consideration at next months meeting. Sunday January 19th we are running our second annual "David Guy's One Disc Extravaganza" so don't miss it. What is a one disc extravaganza? Well thats the best part leave your bag at home and bring two things a putter of your choosing for the first round. A putter as defined for this tournament is any disc with speed 3.5 or lower with a blunt nose so if your putt with a firebird you are SOL. the second thing you need is a disc you are wiling to let a stranger throw. The second round will be the mystery disc round using any disc speed 4 or higher (mids drivers etc.). All the second round discs will go into a lottery and each participant will be given a number assigned to a disc and you will play the second round with only the mystery disc. When bringing your second round disc keep in mind that it must be PDGA legal (no holes, not broken, and not the 99 cent dog discs from pets mart) and it should be marked in a manner so that we can easily return it to you at the end of the day. When you pick this disc remember its what your competition will be throwing so chose strangely, just to make it interesting you wont even get to see your mystery disc until the cards are picked up on the way to your hole to start round two so good luck. As always with a Guy event expect a few interesting mandos and different basket placements just to keep you on your toes.